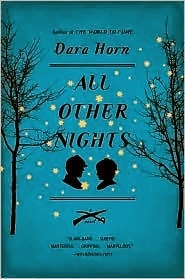 A few years ago I reviewed Dara Horn’s gripping Civil War drama All Other Nights. I had loved her previous novels In the Image and The World to Come and wasn’t the least surprised to love All Other Nights as well. So when I learned about her newest novel, A Guide for the Perplexed, I eagerly awaited its release. It only took one paragraph to know I’d love this one, too. 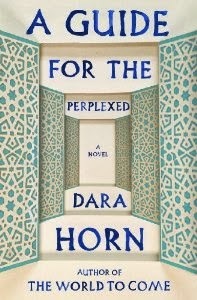 I am so pleased that today Dara Horn will join us here for a Q&A. Dara received her Ph.D. in comparative literature from Harvard University, studying Hebrew and Yiddish. She published her first novel at age 25 (collective sigh!) 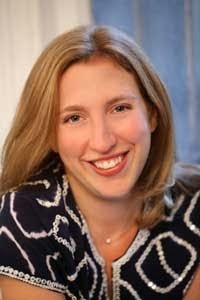 and in 2007 was chosen by Granta as one of America’s “Best Young American Novelists.” Her books have earned many awards and accolades, including the National Jewish Book Award and Editors’ Choice in The New York Times Book Review. All Other Nights, was one of Booklist’s 25 Best Books of the Decade. DH: I was really thrilled. One of publishing’s sordid facts is that book-jacket blurbs are almost always from acquaintances of the writer, or at least from writers who use the same publisher. But I’ve never met Geraldine Brooks or been in touch with her, and we don’t have the same publisher either. So while what she said about my book was very beautiful and apt, there was something even more beautiful about her generosity in saying it at all. I was very moved. JM: How wonderful! More praise in the Boston Globe, Saul Austerlitz called A Guide for the Perplexed your best, which is a tall feat compared to your other novels, especially the brilliant All Other Nights. Can you share with our readers who might not know the background, what inspired you to write this story? DH: A Guide for the Perplexed is about a software developer who invents an app that records absolutely everything its users do. Since I was a child I’ve had a fantasy of turning life into an archive, of writing down and recording everything as a way of stopping time. Now, of course, social media has made my dream come true, and turned it into a nightmare. I was very intrigued by how the technologies of just the past few years have changed the way people experience time—by how all that matters is what’s happening right this second, but of course everything that’s recorded right this second is also archived forever. (Thank you, Google, Facebook, and our friends at the NSA!) I wanted to explore the difference between history and memory, between turning our pasts into collections of evidence and turning our pasts into meaningful stories. The contemporary plot in the book involves a software developer being kidnapped in post-revolutionary Egypt. That makes it sound like a thriller, which it is, but the story is inspired by the biblical story of Joseph and his brothers. (The software developer has a sister who envies her tremendously, and it is this jealous sister who persuades her to go to Egypt in the first place.) I think stories about sibling rivalry are so fundamental to the question of how the past lives within the present, because siblings are usually people who share a past but not necessarily a future. It’s a capsule way of investigating those questions of differing interpretations of the past, and of exploring how much of our lives is up to us and how much is controlled by circumstances we can’t control. JM: Now Josie creates the computer program, Genizah, so users can record every moment. The past is no longer lost forever. Upon learning this program wasn’t available when her mother grew up, Josie’s six-year-old daughter Tali wisely says, “You get to remember everything the way you want, instead of how it really happened.” I love the idea of a memory palace, a place we can visit to remember not only what actually happened, but what we would like to have happened. Can you share your thoughts on memory and forgiveness, major themes in the book. That’s a mind-blowing revision of the past. How can you claim that a heinous crime was actually a benevolent act of God? I think it reveals the selective memory that’s absolutely necessary to make forgiveness possible. If he doesn’t put aside certain memories, or radically reinterpret their meaning, this family can’t have a future. While our own lives are hopefully not that dramatic, we’ve probably all been in situations where the only way forward was by deliberately forgetting (or at least trying to forget) painful aspects of the past. With Tali, the software developer’s daughter, I wanted to create a character who was born into this digital all-remembering world, someone who never had a chance to live in any other way—which is true for most young people now. I’m 36, and I already feel sorry for people younger than me, because they will never have a chance to meet a stranger. Every time they have a date or a job interview or meet a new roommate or potential friend or lover, they will always know a tremendous amount about that person almost immediately, and that person will know a tremendous amount about them. They will never have a chance to create their own first impression, to write their own story about themselves. In A Guide for the Perplexed, I wanted to explore the vast implications of what it means to try to write your own story when the technology (that your parents, or at least your parents’ generation, created!) has already written it for you. JM: That is a disheartening thought. In an interview you wrote: “We’re convinced that we know the real facts and that the people who lived before us were superstitious idiots. The fact that we will someday be our own grandchildren’s superstitious idiots is very humbling to me.” I, too, am fascinated by memories and ancestors who are lost forever. Because of our computerized world –the Internet is forever—do you think our lives will be less mysterious to our descendants? DH: You don’t really think that the Internet is forever, do you? I think it’s very unclear how digital data will be stored on a historic time scale, or how easily that data will be retrieved. My wedding was recorded on videocassettes. I’ve only been married for 13 years and I already can’t watch it anymore without professional help! The past is only as mysterious as we want it to be. People who choose not to learn much about the past end up being nostalgic. But the truth is that “too much information” is an ancient fear. In Plato’s Phaedrus, Socrates argues that now that writing has been invented, people’s memories will be destroyed because no one will bother to remember anything anymore. It’s easy to forget that everyone thinks they are living on the cutting edge of civilization, no matter how long ago they lived. JM: Excellent point, Dara. I love stories with multiple timelines, especially when they’re weaved together flawlessly, as you have done. What are your thoughts on writing with this structure, which you also used for In the Image and The World to Come? DH: You’re right that I used this structure in my first and second novels. When I got to my third novel, I began to see it as a kind of crutch. With my first two books I felt very nervous about plotting—I never wrote short stories, so my first novel was also my first attempt at fiction, at creating a plot—so whenever a storyline began to stall, I would just jump to another time period and start something new, hoping that at some point later I could tie everything together. With my third novel, I decided to eliminate this weakness once and for all, and I wrote that book with a single character’s storyline all the way through, with one plot driving the whole thing. Plot is extremely importantly to me, because I see plot as a moral enterprise—not because there is a “moral of the story,” but because there is a moral in the story: the causes and motivations that we attribute to events are where the beliefs and assumptions embedded in a story are revealed. With A Guide for the Perplexed, I intended to write an entirely contemporary story. But once I understood that I was writing about the possibilities and limitations of remembering the past, it felt dishonest not to bring the past into the book. I needed something more consequential than one person’s childhood against which to test these theories of memory. I used to feel the need to forcibly tie these storylines together—by having the characters be related, for instance, or by having some physical object or image reappear, or something equally improbable. But this time I felt confident enough in creating a real plot that I could let the historical stories run parallel to the contemporary one without creating a contrived connection between them. JM: What a fascinating observation - one that hit home for me. Now for the business side of writing. We all struggle with time constraints, but you must be a master of time management. You are the mother of four young children, you lecture and write award winning novels and non-fiction. You wrote: “After my fourth child was born last year, I created an app that actually dilates time. If you buy my book, I’ll give you one.” Well I did, so please send it over! Really, not to sound cliché, but what advice can you give other writers who struggle to prioritize their writing? DH: I’m one of four children myself, and I watched my mother struggle with this problem while I was a child. She aspired to an academic career and earned a doctorate. But the four of us were born while she was completing it, and as a result she found it too difficult to take on everything else required to continue on that path—college-level teaching, academic publications, attending conferences, all that. She went on to a tremendously successful career in public school teaching—she won awards as the best teacher in the state, and was honored by Scholastic because her students won that prestigious national writing contest for nineteen years in a row (no other teachers had ever had their students win even twice, let alone for nineteen years! )—but it wasn’t what she set out to do. I was very terrified of being derailed professionally by children. Like my mother, I got married very young—I was engaged on my 22nd birthday and got married at 23—but I told my husband that I wouldn’t have children until I published my first book. Then I was very lucky and sold my first book at age 24, and even luckier to be able to have children when I wanted them. So I ended up with these children at a time when writing (and scholarship; I also often teach and lecture, and I publish academically as well) had already become my regular job. My children are all in public school or daycare, and I write while they are out of the house, which works out to something like 9:30am to 2:30pm. (On days when no one is sick and no school is closed, of course—a surprisingly rare confluence of events!) Since my time is so limited, I really do spend every minute of that time working. And since I have this luxury of having writing be my job, I don’t have the luxury of having writer’s block. My advice for writers who haven’t (yet!) been so lucky is to act as though you have been, because what you lack is not really the time, but the will. People make time to go to the gym; they make time to watch their favorite TV shows or to use Facebook or Twitter. The time most people spend online alone is more than enough to write a novel—or a nonfiction piece for a website or magazine, which is how unpublished writers really ought to begin. Give yourself twenty minutes a day. You’d be surprised what you can accomplish in twenty minutes. Write one paragraph every day, even a bad paragraph. Don’t wait until you have time. The time will always be now. JM: Fantastic advice, Dara. How wonderful you had such an inspiring role model. I loved reading in an interview that your mother used to put a timer on the table and give you and your three chatty siblings five minutes each to speak, which turned into five-minute comedies, tragedies and operas. You and your siblings found a way to turn memories into stories. Do you do the same with your children? DH: My parents did this when we were older than my children are now, and my children aren’t yet articulate enough to pull it off. (My youngest is 16 months old, and mostly says “Uh-oh!”) But what I do with them now is what my parents did with me and my siblings when we were younger: instead of attempting and failing to have mealtime conversations, I read out loud to them at every meal. (My husband and I still have our adult dinner after they go to bed.) We usually go through about four or five picture books at every meal this way, with the children choosing the books, and with a fair amount of “discussion” of each book (like “What do you think will happen next?”). I consider this preparation for when they are old enough to tell their own stories. Beautiful! Dara, thank you so much for joining us! Readers, if you’re in the Dallas Area, Dara Horn will be at the JCC on November 5th to launch Community Read. Elizabeth and I will be there! I'm writing this, a bit road-weary, from a roadside Starbucks somewhere near Knoxville, Tennessee, still absorbing the connections, serendipity, and friendships of my past week of travel. This trip brought me back to people I've welcomed into my life over the past two years of writing full-time: a Trappist monk, the staff and crew of a small non-profit, writing friends from conferences and workshops, authors and teachers I've been lucky to meet, and--as always--my family. I marvel at the life I'm creating by staying true and focused to my passion for writing and my purpose-driven quest to promote literacy around the world. It all converges, and the past few weeks encapsulate how my past two years of writing, seeking, and connecting people are all beginning to come together. I started at the Kentucky Women Writers Conference in Lexington, Kentucky, and participated in a fiction workshop for two days with George Ella Lyon, a gifted and beautiful Kentucky writer I met over a year ago through the Appalachian Writers Workshop. I reconnected with other Kentucky writers--friends who are starting their own presses, editing anthologies, completing novels, and leading panels. Friends who are connecting with other writers to say new things and encourage each other. After two days, I left refreshed and inspired enough to complete a short story and a poem. Surrounding myself with literary energy, I've discovered, pushes me along my own path, right when I need it. From there I took a day to revisit the Abbey of Gethsemani. This visit was different from my prior stays: I loaded twenty boxes of books to donate to the International Book Project, who will ship them to a sister abbey in Nigeria that lost its theology library to a fire. Many of you may know about IBP and the work that they do to supply books around the world (and BIG THANKS to those of you who've donated to make this project happen!). The same day I delivered the books for the Nigerian library, I received word from Kumasi, Ghana, that the second library I'd collected and shipped had finally arrived in the hands of the kids of Touch A Life Foundation. It was a full circle moment: planning and shipping a thousand books while the last shipment of books arrived at their new home. There's nothing much sweeter than that feeling! Today, I stopped in Richmond, Kentucky, to visit a friend who has an incredible young adult manuscript he's ready to launch into the world, and we spent almost three hours talking about writing, partnerships, books, and the future. How can we all keep writing, writing for good? And I thought about where I was two years ago: out of work, stepping off a cliff toward an artistic life, jumping into my passion with both feet. I had no idea I'd hang out with monks and ship books around the world. I didn't know my workshops and conferences would connect me with some of my favorite writers and expose me to so many new ones. And I didn't know my life would be so much richer because of the new friends, partnerships, and people who are slowly becoming my ever-expanding writer's circle. I didn't know until I stepped out of my regular life that this whole other world was waiting for me--one full of writers and people wanting to change the world with words. So tonight, here in the cool mountains of east Tennessee, I'm thankful. Thankful that I'm a writer, for good. We had a glorious weekend here in DFW, and sometime during the not-hot Saturday afternoon, I realized this was the beginning of fall. 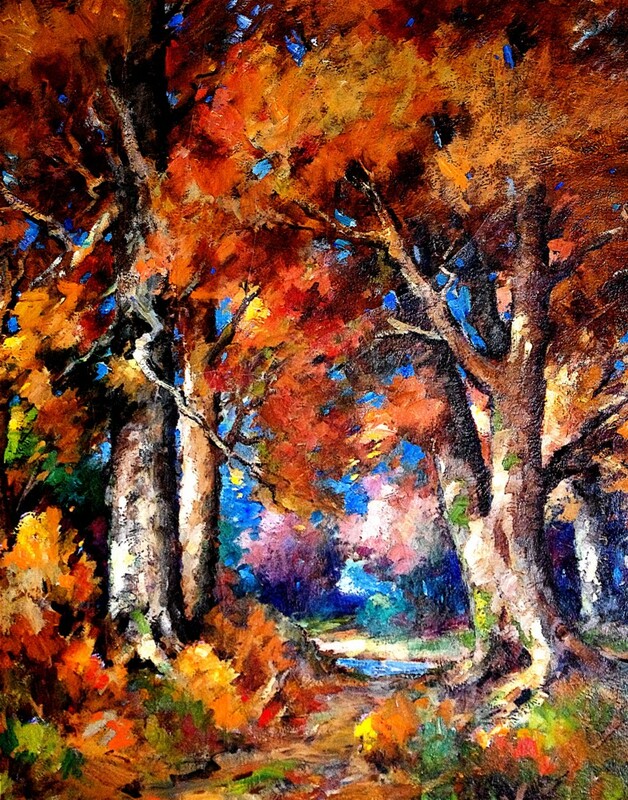 A few years ago I realized that October is my favorite month, really the heart of autumn. One big reason is it means wonderful stews, and for those, I love to turn to my crockpot. And for my crockpot, I turn to Stephanie O'Dea, a blogger I've followed for a number of years who is basically the crockpot queen. Tomorrow Stephanie has a new book coming out, and it felt like a conversation when I asked if we could feature her on the blog. My newest cookbook is available and arriving in your friendly neighborhood bookstore in September. This book took almost two years to write, and it was a definite challenge! It features 365 brand-new dinner recipes (only 10% are from the site, the rest have been kept top-secret!) – all made in the world’s best kitchen appliance: the slow cooker! This is my first cookbook to have color photos, and I am thrilled with the way they came out, thanks to photographer Tara Donne. Like my other cookbooks, the recipes are completely gluten-free, and even the photographed food is gluten-free! (If you aren’t gluten free, simply ignore my notes…) You’re going to love this cookbook!! 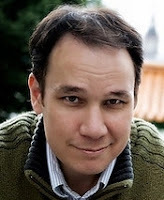 EL: We at WWW are all fiction writers, and though we've featured a few non-fiction authors, you are the first cookbook author we've interviewed at WWW. Can you give us a little history on how you came to get published and what the process was like for you? SO: I have a literary agent. I signed with her back in 2006 or 2007 to help sell my Totally Together book. She was wonderful--we kept getting turned down but finally secured a book deal, only to have the publishing house decide at the last minute to not publish it because of the down-turn to the economy. I was so worried she'd dump me! 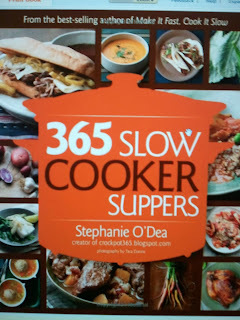 The slow cooker thing kind of took a life of it's own after I ended up being on the Rachael Ray show (I got on because I emailed the show through their website) and book publishers started to email. I had a few publishers interested and Alison (my agent) handled all of the negotiation. EL: As I understand it, your books and appearances etc. all started with your blog back in 2008. What inspired the idea for it, and what was that year like both from a cooking and writing point of view? SO: I started the blog because I needed a job. We had moved back to the Bay Area and I was teaching preschool but had to quit because my (then) 2-year-old was vomiting sporadically. I thought it was day care germs so I quit working, even though we really (really) needed the income. We found out that she has Celiac (she's fine now!) which at the time wasn't as prevalent as it is now; I didn't even know what gluten was! After she recovered, I began working part-time for BlogHer at home and was also writing for Bay Area Parent magazine. I liked both jobs but could tell through my work at BlogHer that there were very (very) successful bloggers making a good living at home. I wanted that! So I decided to blog --- but the catch was that I knew I wasn't interested in divulging too many personal details with the Internet. 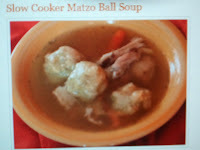 I liked the google-ability of food blogs and joked with my husband that since I didn't really cook, I only knew how to "crockpot," I should write about that. And that's how A Year of (CrockPotting) Slow Cooking got started. EL: With fiction, rewriting is probably a bigger part of the process than the initial writing. Is that true for cookbook writing? How about "rewriting" recipes--what do you go through with that process? SO: I really like writing. I recipe test the ingredients part of the recipe a few times, but write and "write in my head" the Verdict or an Introduction to a recipe quite a few times before submitting. I am lucky in that my mom is a fantastic editor and she looks over everything I do before I let an editor see it. I went to school for English Lit and always thought I'd write "something," although cookbooks never (ever!!) entered my mind! EL: Is there a recipe in the new book that's your favorite? SO: One of the recipes in the new book made a big splash online: the slow cooker matzo ball soup. You are more than welcome to repost it, if you'd like. EL: I have two kids myself, and have been very aware of maintaining our family privacy when this blog was launched. As someone with a public presence, how do you balance privacy and exposure? SO: I don't share anything in print that I wouldn't want EVERYONE to know. I don't have a personal facebook page, and I'm cautious about ever referring to the kids by name. But I am still exactly who I am. My friends in real life aren't surprised by anything because I'm not trying to be someone/something I'm not. I might not share every last detail of my life online, but the stuff I do share is exactly the truth, and nothing but. EL: That said, any fun "Aren't you Stephanie O'Dea?!" stories? Double points if they take place in an elevator; triple points for the ladies' room. SO: No! Gosh, now I'm depressed! EL: What's the best part of promoting a new book? What's the most challenging? SO: It's very satisfying to have something tangible in my hand to show my children and parents. It's neat to be online, but there's something more legit about seeing your name on a piece of paper. As for promotion, I try super hard to not over-promote online. It's hard, because that's what your publicists and editors want, but I grew this audience over a bunch of years and I don't want to take any of them for granted. If someone wants to buy a book, they'll do it. But nobody wants to get pitched at 24/7. EL: Finally, what question do you never get tired of? I never get tired of people asking for help with going gluten free. It was a tough realization for me that I'd have to overhaul our whole way of life, and if I can help anyone fare better than I did in the early stages, I'm happy to help. A friend of mine recently alerted me to a potential agent to query. After some research, I clicked over to the agency website for submission instructions. This particular agent uses an online form rather than a traditional query letter, something I’ve encountered before, but the questions she asks…well…there are a few doozies mixed into the usual fare. Two are especially challenging, but they are useful exercises for writers and, I imagine, helpful to her in evaluating queries. One thing she requests is a log-line, or a (hopefully compelling) one sentence description of your story. Thanks to Twitter contests like Pitch Madness and PitMad, I’ve got that handy. If you currently reside in Queryland and have not yet gone through the agonizing torture process of writing a log-line, it’s an enlightening experience. Agents have differing opinions about using log-lines in queries – some love it, some hate it – but if you can’t compose one, your manuscript may lack focus. This agent mentioned in an interview that leaving this space blank is the biggest mistake writers make. It’s the first thing she sees – above the query letter – and it is a good place to hook her. What she essentially wants is a tag line, that sentence often seen on the cover of a book. Yes, this is a tough one but, again, it could be a useful exercise for any writer. Don’t know where to start? Here are some ideas. A) Most writers can compose pretty sentences, but pretty does not necessarily equal compelling. The chosen sentence must have tension or at least intrigue. A potential problem: conflict-filled scenes are often filled with short sentences. Staccato. Difficult to stand on their own. B) If the agent does not rep romance, for example, it may be risky to have a sentence involving sensuality, declarations of love, or any hint of melodrama. C) The sentence should reveal something about your specific characters or story. If it doesn’t, it may be too generic. I’ll play guinea pig here, and offer up my original list of potential sentences as an example. Some clearly fall into the pitfalls I mention above. 1) The varnish, like my smile, is but a protective skin painted over a wound that will take a lifetime to heal. 2) I lie awake most nights and imagine sorrow seeps from the cracks in our bedroom ceiling. 3) Under the right circumstances, any sin might be forgivable. 4) I must let her leave, but I refuse to ever let her go. 5) Leaving her would be both my life’s greatest regret and an act of kindness. 6) Her touch is light, gentle, and it lulls me into such a drowsy state that I pay no attention to what she does until I feel the cold blade of the scissors pressed against my scalp. 7) I promised to love, honor and argue with him until death us do part. 8) My greatest fear is that God will punish me for this crime with a long and miserable separation before He allows me to join Carl in heaven. 9) I can’t be both a good mother and the wife Carl needs. 10) No matter what method I choose, creation’s process is physical, messy, and exhilarating—a sensual act filled with intoxicating smells and infinite variety. 11) I touch her back, a silent apology while the gentle brown rain falls onto the casket. 12) I’d rather suffocate together than languish apart. 13) When Carl paints well, his soul is like the Sound’s channel, where viridian and Prussian blue waves dance, collide, and merge into a turquoise vibrant enough to make my eyes ache. 14) Without me, he’d probably be ten years in his grave, but history would remember him as a Master. 15) He must be first; before the children, before music, before anything at all, and not just first, but second and third, too. 16) Barili dangles a golden carrot in front of her and my illness will forever shackle her just out of its reach. When you have your list, send it to a bunch of people for their opinions. My What Women Write colleagues helped narrow my list ten. Here it is again, with strikeouts. We have a diverse group and all had strong opinions. No one agreed. I sent my shortened list to an editor friend and the one she chose (with plural exclamation points) confirmed my instinctual choice. I do not offer it here because I’m curious to see what you think. What sentence grabs you the most and why? Are there any you would cross off the list? A somewhat-serial visitor to our blog (Joan interviewed him here in 2009 after he appeared at the Crow Museum of Art, and Elizabeth shared his impending visit to Richardson Reads One Book in 2011 here), Jamie Ford once again graciously agreed to answer a few questions about his new book Songs of Willow Frost as he visits Dallas tomorrow night at Highland Park United Methodist Church in Dallas. 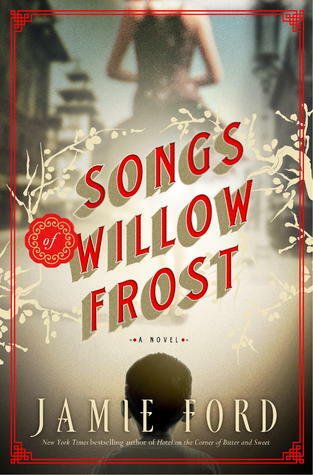 Jamie Ford, New York Times bestselling author of the beloved Hotel on the Corner of Bitter and Sweet, presents his much-anticipated second novel: Songs of Willow Frost. Determined to find Willow and prove that his mother is still alive, William escapes from Sacred Heart with his friend Charlotte. The pair navigates the streets of Seattle, where they must not only survive but confront the mysteries of William’s past and his connection to the exotic film star. The story of Willow Frost, however, is far more complicated than the Hollywood fantasy William sees onscreen. Welcome back, Jamie! We’re excited to get our hands on this new novel. How was the writing process for this book different from Hotel on the Corner of Bitter and Sweet given your touring schedule to promote the novel, cramped autograph hand, constant posing for photos, paparazzi and all? The process was quite similar. About six months of research and then three months for the first draft—which is identical to Hotel. And like with Hotel, I didn’t show it to anyone until I was done, then it went to the Holy Trinity of my writing life: My wife, my agent, and then my editor. You shared that when you wrote Hotel, you were actually writing another book at the time and stopped to tell the story of Henry and Keiko after writing a short story about them. Then you mentioned your next book was going to feature a Kamikaze pilot and yet now we have William and Willow. Is it poison to mention a book before it’s finished or do you think it’s just best to keep an open mind about what story needs to be told when? I’m not really superstitious about these things, and I’ve always been fairly transparent about what I’m working on. People ask, so I share, and sometimes the subject of that discussion changes. I wrote Hotel and then was working on another book when William and Willow showed up and said, “Um, excuse me, but we really think you should tell OUR story next.” Who am I to argue with my imaginary friends? Was there a particular event that inspired Songs of Willow Frost? Not exactly an event, but a place, which has a minor role in the book and that’s the Wah Mee Club, which is the backroom gambling parlor in Chinatown where my grandparents met. My grandfather was a blackjack dealer and my grandmother was a coat-check girl. My research began around that place, during prohibition and the Great Depression. Once I had a better understanding of the place, time, the social dynamics of that era, I was able to wind up the characters of William and Willow and turn them loose. I glimpse some similarities in the two novels—the Seattle setting, childhood friendships between a boy and girl, alternating time periods, the need for family connections. Do you think these storytelling elements speak to you for any particular reason? I gravitate to young protagonists because that was the age when I first felt heartache—from that first crush, to losing friends, to seeing the cracks in the foundation of my parents’ marriage. And all of those complex emotional dynamics were introduced to me in and around Seattle—it’s an emotional well that I keep returning to, and will write about for at least one more novel. Then who knows, once I’ve exorcised my Seattle demons maybe I’ll be ready to move on to another city, another location. How’s Cleveland these days? I'm not sure Cleveland has the same charm as Seattle, but who am I to judge? I wanted to share that I read Hotel with my book club and then with the book club I coordinate at a retirement village—thankfully we were able to find it in large print, audio AND in German (for one resident who prefers to read in her native language). I wish you could have been there to hear some of the stories they shared about the internment camps they witnessed. Has one experience in particular from a reader stayed with you? I’m sure you get emails and hear comments at book signings. Wow, where do I begin? I was invited to the Minidoka Reunion (and I went, of course). That was incredible, and they even had a karaoke night where former internees sang "Don’t Fence Me In." Another special moment was receiving a handwritten letter from Monica Sone who wrote Nisei Daughter in 1953, the first book to really address the Japanese Internment. I happened to have a first edition hardback of Nisei Daughter (with dust jacket) and Monica, who was ninety-one at the time, didn’t have a copy in hardback. I was delighted to give her mine. How generous of you to share that with her! Although I'm not at all surprised given the amazing trip you took with your family this summer. Do you see any of your adventures showing up in your writing anytime soon? Those weeks in the bush village of Pommern (Tanzania) were amazing. And watching my kids work in the schools and the AIDS clinic––Wow, that was the proudest, happiest, most satisfying experience ever. I don’t think that trip will spill into my fiction anytime soon, but it definitely changed who I am and how I see the world. And my wife is going back in November with another nurse. What a wonderful way to spend time with your kids. 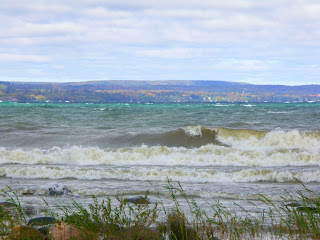 Thanks, Jamie, for stopping by the blog again! Join us at Highland Park United Methodist Church in Dallas tomorrow night, September 19. 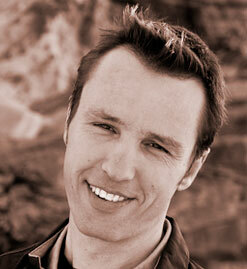 The 7 p.m. presentation is free; a reception featuring Jamie is $30 (signed book included). Register for the reception at HPUMC.org (search for “Jamie Ford”). 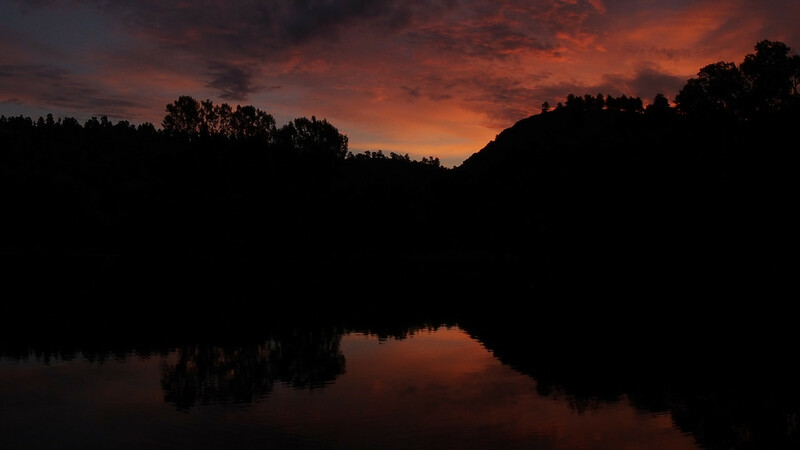 Over the past several days, parts of Colorado have been pummeled by severe flooding. Roads are closed from rockslides, gushing sewers and collapsed bridges. Towns have turned into islands, six people have died so far and over a thousand are unaccounted for. 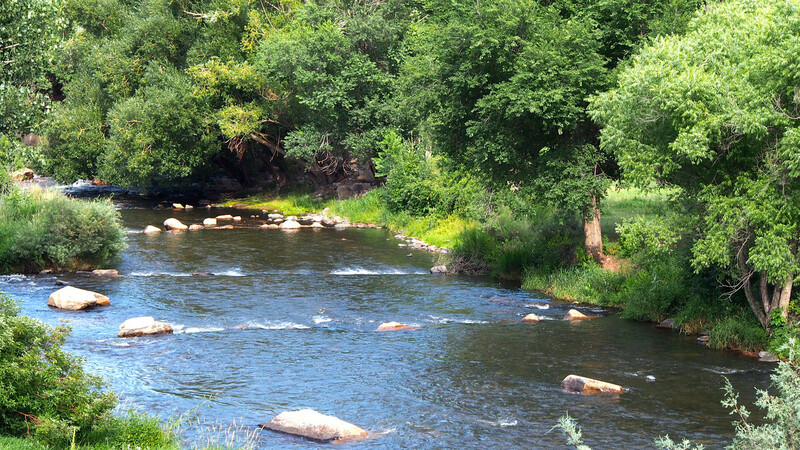 Less than six weeks ago we stayed at the Sylvan Dale Guest Ranch in Loveland, Colorado, nestled in the now-flooded Rocky Mountain foothills. Not knowing disaster was imminent, our host showed us scarred trees from the 1976 Big Thompson River flood, in which over 140 people died. As she spoke, floods seemed like a distant, if painful, memory. Suddenly this staggering catastrophe is their present reality. We were on the first leg of our long trip, visiting friends Linda and David Jessup. We know Linda from our Maryland days. She is the founder of PEP (Parent Encouragement Program), the superb Washington, D.C. area organization that teaches parents to raise independent, respectful and cooperative individuals. We feel a deep gratitude to Linda and her legacy, and over the past twenty years have supported PEP with both time and money. 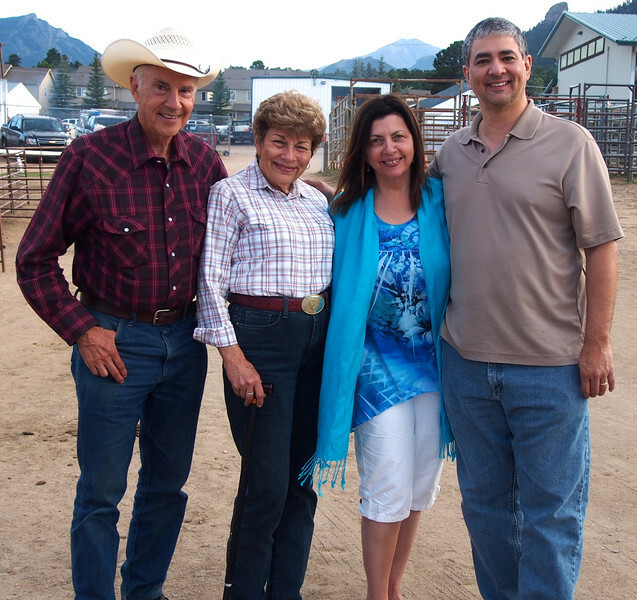 David’s parents purchased the Sylvan Dale Ranch right after World War II and, with hard work and determination, transformed the property into a working guest ranch to share nature’s beauty with others. 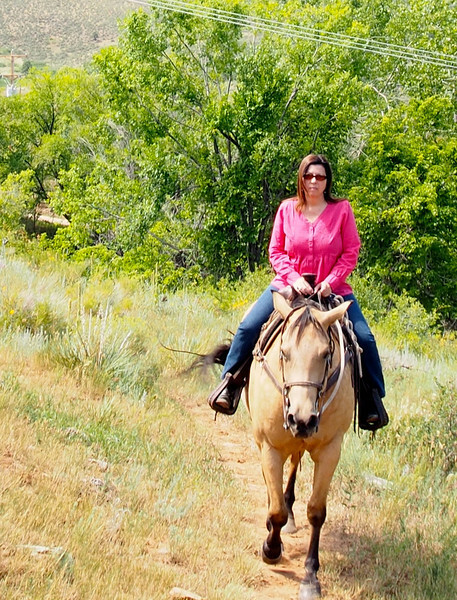 The ranch is a geological wonder, set between Mexican sandstone and Alaskan granite where guests can ride horses, hike, rock-climb and fish. Sylvan Dale accommodates meetings and weddings as well. Of course I was thinking it would be the perfect setting for our next writers’ retreat. Or yours. 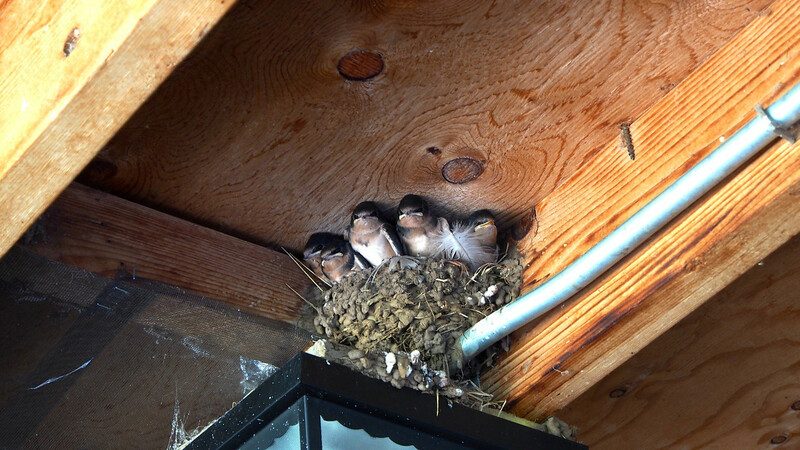 At dinner our first night, a handful of barn swallows waited for their mama in the eaves of the awning, while a nest of flycatcher babies huddled nearby. We navigated by flashlight to the campfire where we sang “Coming ‘Round the Mountain” and “This Land is My Land,” and toasted s’mores. We stayed in the Annie Oakley cabin, a quaint, romantic cabin with a front porch view of the rippling river. 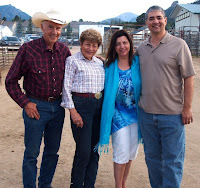 One night we attended a chuck-wagon cook-off in Estes Park and enjoyed beef stew, cornbread and peach cobbler with our friends. In Loveland proper we went to a sculpture show, read inscriptions at a cemetery and visited Anthology Books, where David wrote his novel Mariano’s Crossing. 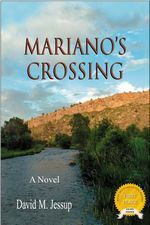 A western tale set in nineteenth-century Colorado, Mariano's Crossing won the Rocky Mountain Fiction Writers Contest and has garnered great reviews. We were not surprised to hear the animals at Sylvan Dale are treated with respect and encouragement, too. Like children, Linda said, animals want to know where their boundaries are. 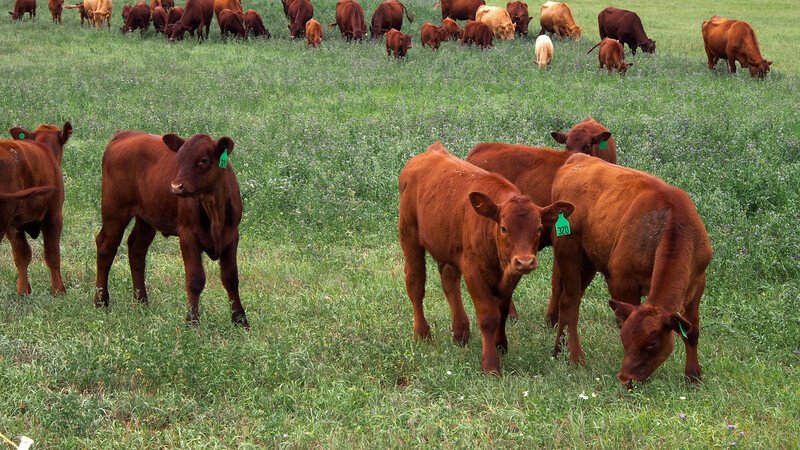 Mango the rancher directed the grass-fed cattle from one field to another by yodeling. He’s been known to drop to his knees to get face to face with his charges. With his sunburnt face and smiling eyes, it’s no wonder the cows’ tails wagged like dogs. I knew they were happy, if only for a while. At breakfast one morning we met the lovely young artist Ashley Kolarek. Ashley is a camp counselor and wrangler at Sylvan Dale and her passion is art. She designs and creates metal art pieces in stainless, bronze, copper and aluminum. Her recent piece “The Glass Slipper,” created from horseshoes and colored glass, now sits on our coffee table as a reminder of our time there. Ashley does custom sculpture, jewelry and wall hangings, so look for her on LinkedIn or email her at ashart519 (at) gmail.com. I'm a city girl, really, so my mind conjured brown bears and snakes at every turn. 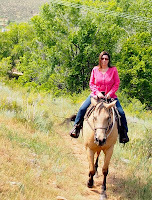 I spent several nervous minutes on trail ride with Sandy, a sweet horse who ignored my anxious vibes and gently trotted me through lovely hills and trees. This trip was a creative journey for both of us. 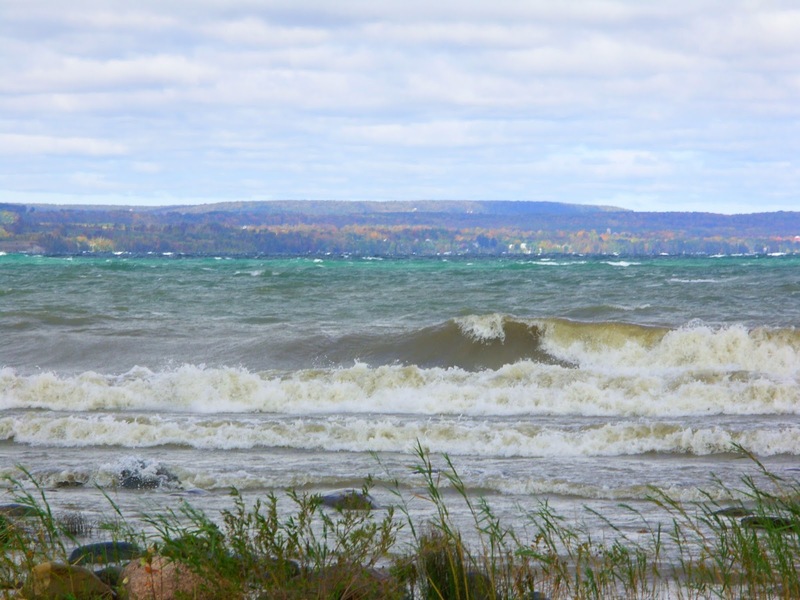 As my husband captured our surroundings visually, I recorded images in my journal: Panoramic views sweeping across the horizon, rock mountains and grasses, lakes and rivers. 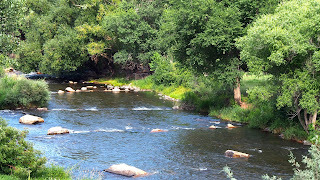 Nature’s noises: cows mooing, horses snorting and bristling, river rushing over rocks, gently. 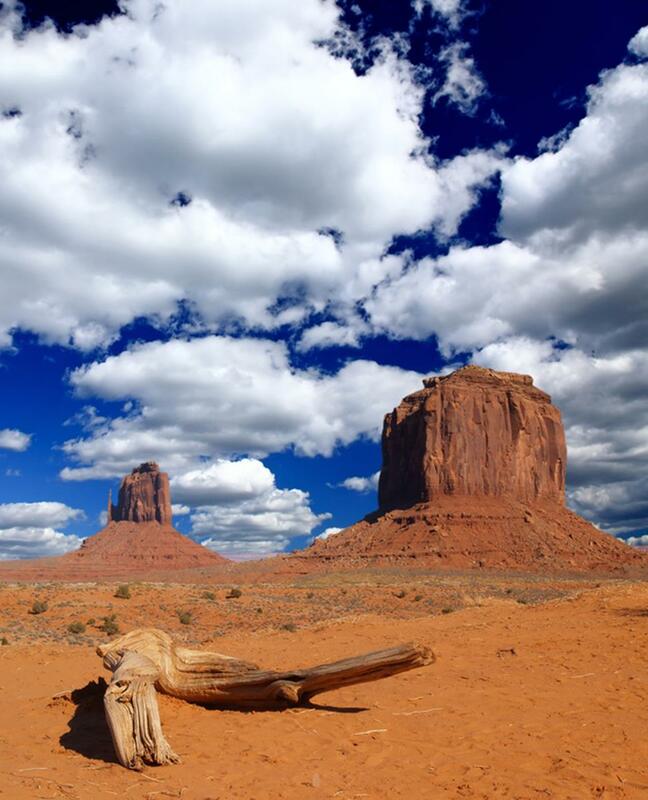 As of today, we hear everyone is safe, including the horse and cattle herds. I wonder about the barn swallows and the flycatchers, about the Annie Oakley cabin, about newly scarred trees. Rescuers are airlifting those stranded and in the following months thousands of professionals and volunteers will help to rebuild. The people there are hardscrabble and resourceful, they will recover. Our best wishes for the safety of everyone there. 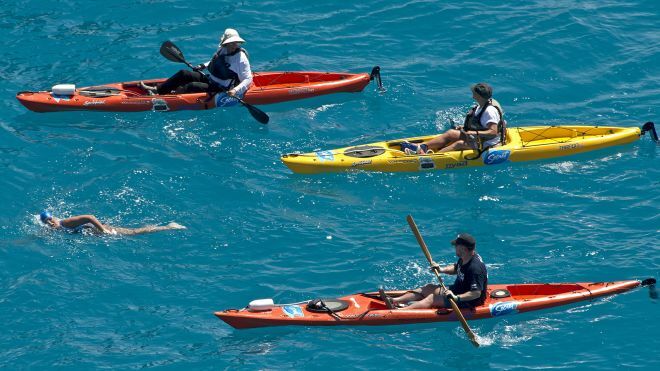 By now, everyone's heard of the amazing Diana Nyad, who swam for almost 53 hours straight over Labor Day weekend from Havana to Key West without a shark cage, becoming the first person to ever do so. There are so many reasons this feat was incredible, even removing the grueling physical aspects of swimming for 52 hours and 54 minutes from the equation. 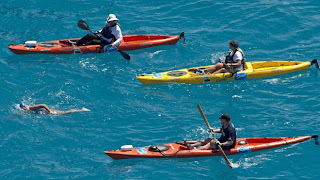 She was surrounded by deadly jellyfish, the weather and water conditions had to be near-perfect, and most fascinating of all, she is 64 years old. But what I've returned to over the past few days as I watched her interview with Dr. Sanjay Gupta wasn't her crackled and sunburned skin, her swollen tongue and mouth from the jellyfish mask, or—frankly—even her age. 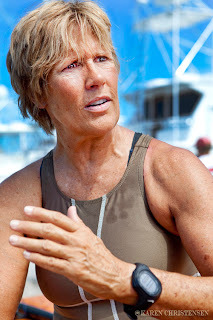 The lasting impression from Diana Nyad's record-breaking swim, for me? She'd attempted and failed the seemingly impossible dream four times before, beginning when she was 27 years old. This-- at age 64-- was her fifth attempt. It's a great reminder, isn't it, that everybody fails? Instead of thinking only about success, think about each failure that brings you to your next choice. Should you try again, or quit? It made my own goal of publishing my first novel seem very small. And with each failure along my twenty-five year writing road I was faced with a choice: keep writing, or quit, knowing that if I quit writing tomorrow, no one would beg me to continue. I'm sure she'd been told for her entire life that her dream was impossible, yet that didn't extinguish her passion for attempting it again, and again, and again. Is the passion that drives Diana Nyad to swim the same passion that burns in all of us? Some of us change our dreams as we age, or transfer our dreams for ourselves into dreams for our children. Many, many of us simply quit: too tired to continue at something that feels impossible. But what if we don't quit? Each year, we here at What Women Write attend the Richardson Reads One Book event as a group--whoever is available, usually most if not all of us! We were super excited to learn that the 2013 book was The Book Thief, and that Markus Zusak would be the special guest! Several of us had already read and loved the book. Set during World War II in Germany, Markus Zusak’s groundbreaking new novel is the story of Liesel Meminger, a foster girl living outside of Munich. Liesel scratches out a meager existence for herself by stealing when she encounters something she can’t resist–books. With the help of her accordion-playing foster father, she learns to read and shares her stolen books with her neighbors during bombing raids as well as with the Jewish man hidden in her basement before he is marched to Dachau. This is an unforgettable story about the ability of books to feed the soul. 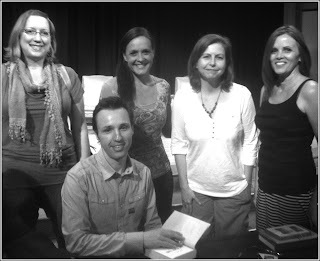 Susan, Pamela and I (and eventually, Elizabeth, after a prior obligation with her kiddos), along with Susan's daughter and a friend of Pamela, met up last night for a delightful evening listening to Zusak speak about writing and reading and The Book Thief. I knew it was my turn to blog, so I jotted a few notes to share with you. We loved hearing the story of Zusak's first few events after his debut in Australia years ago. It was heartening to hear that even a world class author like this had to more or less bribe the high school rugby team he coached to come to his launch so it wouldn't be just him and the bookseller. Look at him now--more than a thousand rabid fans attended this event! He talked a lot about story. He started by sharing a funny family anecdote, then talked about what made it work for the audience. These are lessons that can be applied to writing, public speaking, or any situation where you need to tell a story your audience connects with. It's yours. In this case, it was his family's story. The details are what makes your story believable. (For instance, knowing not only what color a jacket is, but what's inside the pockets.) If you know the details, you are the expert. You are the owner. People believe people who know the details. The best moment in a story isn't the expected, but the unexpected. Stories make us who we are. Want to do something else innovative or creative? How do your stories make you who you are? If you haven't read The Book Thief yet, we suggest you run right out and find a copy and devour it (as we are sure you will) before the movie comes out in November! What's Your Go-to Writing App?